If you’re stuck with a Windows machine and have always been jealous of how your friends with macbooks could simply swipe two fingers on their touchpad to scroll, you don’t have to feel sad anymore. There’s a program that will let you do just that! Simply download Two Finger Scroll from the project page on Google Code. 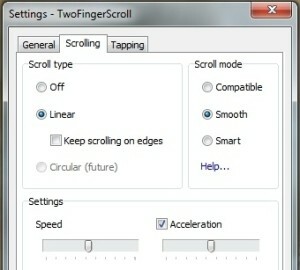 You can set a whole lot of things in the settings box, including the speed and acceleration of the scroll. It also has a few options for tapping as well. You can use it to make a three finger tap mean a right-click, if you want. Of course, if you want features like pinch-to-zoom and that kind of thing, you’ll require a complete driver replacement, and that’s a topic for another day!